Combination windows are an integration of sliding, casement or fixed window in any possible combination in a variety of sizes and designs as per your need. 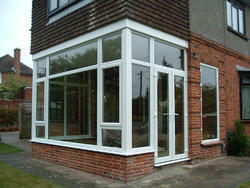 The advantage is that all the windows are built into one attractive, strong, integrated frame. It not only serves the perfect utilitarian purpose of sound and thermal insulation, design flexibility but also creates an architectural feature in the home.